E.M. Workbench. Fast Field Solvers front-end. 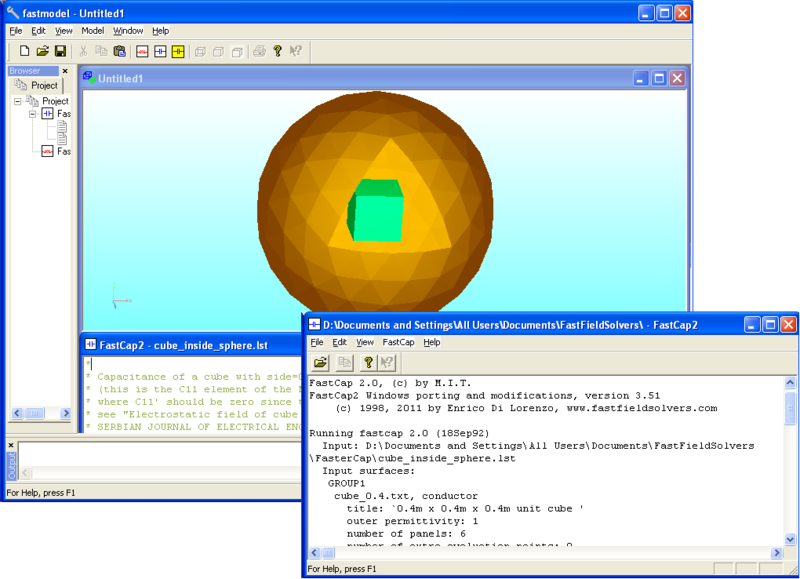 The ElectroMagnetic Workbench offers a full GUI-based 3D modeling interface for FastHenry. 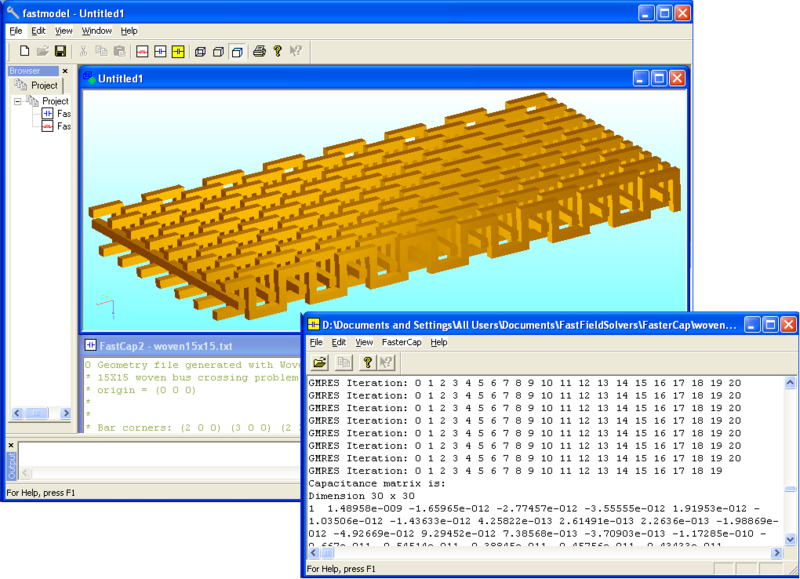 The workbench is based on FreeCAD, a parametric 3D CAD modeler. Parametric modeling allows you to easily modify your design by going back into your model history and changing its parameters. FreeCAD is open-source, multi-platform and highly customizable, scriptable and extensible. The ElectroMagnetic Workbench is still being further extended to cover also the other Solvers, to offer a modern, powerful and free front-end and back-end interface for the Fast Field Solvers. The FreeCAD ElectroMagnetic Workbench add-on code is available from our download section. FasterCap. Capacitance extraction at scale. FasterCap is a powerful three- and two-dimensional capactiance extraction program. Build upon state-of-the-art technology, overcoming the limitations of FastCap2, and able to handle lossy dielectrics, with automatic mesh refinement, error control, and out-of-core capabilities, FasterCap can handle huge geometrical models without resorting to any windowing technique, and therefore preserving the far-away interactions for maximum accuracy. Out-of-Core capabilities are also greatly enhanced by the recent widespread availability of the new solid-state Hard-Disks with fast access times. Combined with the smart FasterCap algorithms that efficiently serialize the data for sequencial access, big amounts of fast virtual RAM are available for supporting huge simulations. FasterCap improves the capabilities of the premium 'golden reference' FastCap2 software, while preserving the accuracy for which FastCap2 is renowed. For large simulations FasterCap is faster, requires less memory, and provides additional capabilities with respect to FastCap2. FasterCap is available for MS Windows as well as for Linux 32 and 64bits operating systems, in binary and source formats, in our download section. For more details about FasterCap, including a comparison of FastCap2 vs. FasterCap, visit our FasterCap page. FastCap2. Golden reference capacitance extraction. 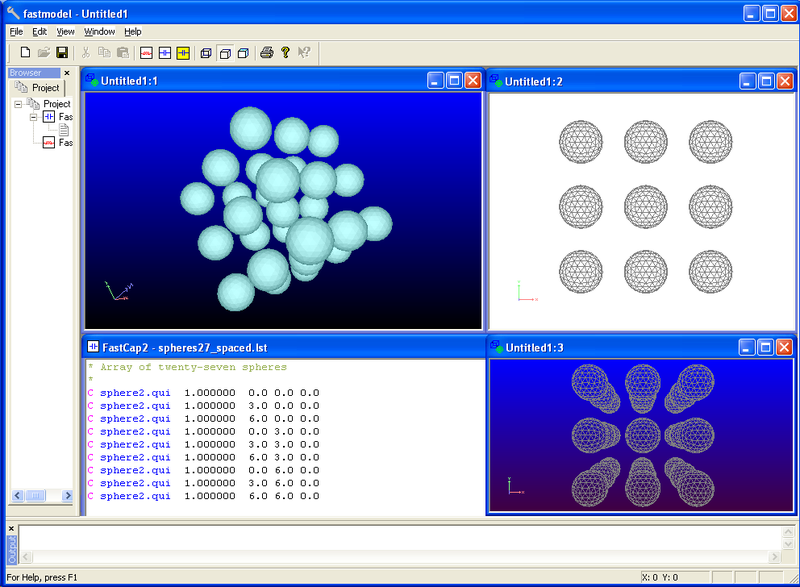 FastCap2 is a software for computing the self and mutual capacitances of conductive three-dimensional structures embedded in a dielectric. The dielectric can be homogeneous or inhomogeneous. A de-facto golden reference standard, FastCap2 is derived from FastCap, originally developed by Keith Nabors at M.I.T. on Unix platform for the solution of Maxwell equations and extraction of capacitiances. Binary and source code versions, including the original M.I.T. code, are available from our download section. The original FastCap source code distribution is also available directly from M.I.T. at the link in our links page. For more details about FastCap2 visit our FastCap2 page. FastHenry2. Golden reference inductance extraction. FastHenry2 is a software for computing the frequency-dependant self and mutual inductances and resistances of a generic tridimensional conductive structure, in the magnetoquasistatic approximation. It can also generate Spice-compatible, multiple-frequency equivalent-circuit models. A de-facto golden reference standard, FastHenry2 is derived from FastHenry, originally developed by Mattan Kamon at M.I.T. on Unix platform for the solution of Maxwell equations and extraction of inductances and resistances. Binary and source code versions, including the original M.I.T. code, are available from our download section. The original FastHenry source code distribution is also available directly from M.I.T. at the link in our links page. For more details about FastHenry2 visit our FastHenry2 page. 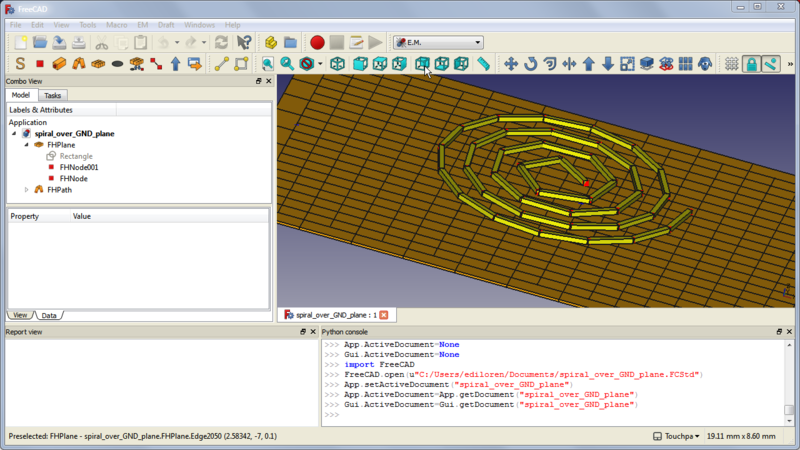 FastModel is our 3D viewer and text editor for FasterCap, FastCap2 and FastHenry2 files. FastModel provides a front-end graphical interface that allows you to easily model and see in real time the geometry described in the field solvers input files. FastModel supports FastHenry2 and FastCap2 input file formats, including the Patran interface for FastCap2, as well as support for non-hierarchical FasterCap files. Binary and source code versions are available from our download section. VoxHenry. Inductance extraction for voxelized structures. VoxHenry is a magnetoquasistatic (MQS) inductance extraction simulator for voxelized geometries. It is under some regards similar to FastHenry, as it can extract inductance and resistance values, but it is based on voxels, that are the 3D equivalent of the 2D pixels (simply put, voxels are 3D cubes). VoxHenry can handle a huge number of voxels, and has advantages over FastHenry when dealing with conductive structures that are not inherently long and thin (as FastHenry segments are). VoxHenry has originally been developed by Prof. A.C. Yucel and Prof. J. White at M.I.T. in MatLab language, enhanced with contributions by A.G. Polimeridis, I.P. Georgakis, H. Bagci as well as improvements and optimizations by FastFieldSolvers, including porting under the free and open-source Octave environment. Porting to C/C++ for performance and speed is ongoing. The source code is available through a link from our download section. Surface-based, wide bandwidth, fast field solver. 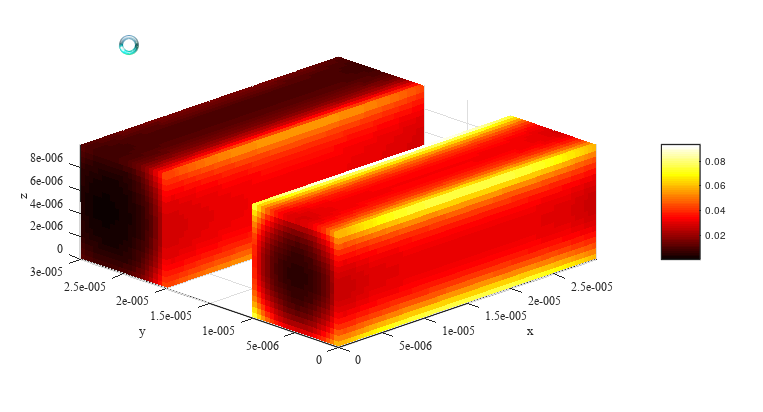 FastImp is a program for accurate analysis of wide-band (full-wave) electromagnetic effects in very complicated geometries of conductors. It is based on a surface formulation, therefore the geometries are defined only through surface panels, making it easy to describe arbitrary shapes. FastImp has originally been developed by Zhenhai Zhu at M.I.T. on Unix/Linux platform for the wide-band solution of Maxwell equations. Binaries and source code, including the original M.I.T. code, are available from our download section. The original FastImp source code distribution is also available directly from M.I.T. at the link in our links page.